If you are interested in commenting on the first draft, then please download the document (here) particularly focussing on points 4-6 and returning to Heather Benway by 7th June 2009. More information on Solas web site. 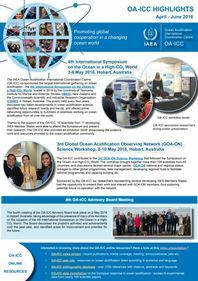 IOC, SCOR, IGBP and IAEA have recently produced a number of documents about the latest knowledge on Ocean Acidification and priorities for future research, as a result of the Second Symposium on the Ocean in a High-CO2 World in October 2008. The publications are all available on the following website and involve a large number of international experts. The Ocean Carbon and Biogeochemistry Program Ocean Acidification Subcommittee is currently discussing how to coordinate and provide input to the recent EPA federal register notice on ocean acidification. If you would like to be involved, please contact OCB Ocean Acidification Subcommittee co-chairs Joan Kleypas (kleypas@ucar.edu) and Richard Feely (richard.a.feely@noaa.gov). DOCUMENT ACTION: Notice of data availability (NODA). This NODA provides interested parties with information submitted to EPA on ocean acidification and solicits additional pertinent data or information that may be useful in addressing this issue. In addition, EPA is notifying the public of its intent to review the current aquatic life criterion for marine pH to determine if a revision is warranted to protect the marine designated uses of States and Territories pursuant to Section 304(a)(1) of the Clean Water Act. The NODA also solicits additional scientific information and data, as well as ideas for effective strategies for Federal, State, and local officials to address the impacts of ocean acidification. 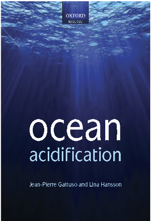 This information can then be used as the basis for a broader discussion of ocean acidification and marine impacts. EPA also requests information pertaining to monitoring marine pH and implementation of pH water quality standards. DATES: Comments must be received on or before June 15, 2009. Following its success in the field of science, the European Project on Ocean Acidification (EPOCA) has expanded its activities to also include the fashion industry. It has opened its first retail shop in Shanghai (photograph above, courtesy of Markus Weinbauer). All profits generated by the first 6 months of operation will be distributed in cash to the participants of the EPOCA annual meeting which will be held in Plymouth, UK, from 30 June to 2 July. At the meeting, the project Scientific Steering Committee, advised by the International Scientific Advisory Panel, will decide on future shop openings. The Federal Ocean Acidification Research and Monitoring (FOARAM) Act passed in the House of Representatives and Senate respectively on 3rd and 19th March 2009.